[RECAP] And what He's saying to the man is, 'I am going to heal you! You are going to hear and you are going to speak clearly.' And He did it. And there's a message to the disciples. You have knowledge, but don't understand. You hear, but don't perceive. You don't grasp. So when you speak, you're not saying what needs to be said clearly. Now in chapter 8, verses 1-10, Jesus does a re-run miracle. It's a repetition. He feeds four thousand, only this time He has seven loaves instead of five. So, the odds are better. Some people in the past at least have questioned whether this actually happened because they're saying, 'Well, it's two miracles, virtually alike, it's just that the disciples couldn't tell the difference between five thousand and four thousand.' Ha, what a joke. People who can write the way Peter can write. People who can communicate the way John can communicate and also write couldn't count to four thousand? Of course they could. There's a reason why Jesus did this same miracle a second time and I'll tell you what it is. He is reaffirming the first two realities. And my friend, let me tell you something. If you will turn radically to Him as a leader, if you will take all your skills and give them to Him, if you will take your career, your business, your ministry, your profession, and say, 'Here it is, it's Yours! '…He will do what you cannot do with what you do not have. But right in the middle of this whole sequence, there's a very significant interruption. Following the feeding of the four thousand in Mark 8:11, the Pharisees once again show up and they began to question Jesus. And they did not come to trust Him, they came to test Him. This is very important. They did not come to trust Him. In verse 11, Mark 8:11, they came to test Him. And so they asked Him for a sign from heaven because they wanted to control Him. They wanted Him on their terms. They said, 'Give us the sign that satisfies us and we'll believe in You.' But Jesus is not a performer. He doesn't give signs on that basis. And so He told them, 'No sign will be given to you, I'm not going to give you a sign.' (cf. Mk. 8:12) And at that point, they left Him, got back into the boat and crossed to the other side. Ha, can you believe that? You know, we really should believe that because we're just like these disciples. We hear the words, but miss the point. We hear what He says, but we don't get His message. And Jesus says to them, 'Why are you talking about bread? What is it with you? Why are you talking about having no bread?' I mean, the reality of the matter is, I could feed thirteen men with one loaf of bread, so could you…they wouldn't get much, but we could do it. This is silliness. And He says to them, "Do you still not see or understand?" (Mk. 8:17b) 'Don't you understand the way that Syrophoenician woman understood?' "Do you have eyes, but fail to see and ears but fail to hear?" (Mk. 8:18) 'Are your ears like the ears of that man that I opened…the tongue that I loosed? And don't you remember when I broke the five loaves for the five thousand how many basketfuls you picked up?' And they said, 'twelve', I'm sure they were a bit embarrassed. (Mk. 8:19b) "And when I broke the seven loaves for the four thousand, how many basketfuls of pieces did you pick up?" They answered, "Seven." (Mk. 8:20) By the way, there's a difference in the words. The basket in Mark 6, the feeding of the five thousand…it was like a backpack. The basket in Mark 8, the feeding of the four thousand, is like a body bag. It was as big as a human being! Don't you see the point? There is abundance of resources in Jesus. Abundance of resources! Do not be discouraged. Do not be disheartened. Enter in, learn what it means to trust Him. Take Him at His word. Rest in Him. Be faithful in trusting Him. And you will see His abundance and it will grow and it will grow and it will grow and over years you will see an amazing abundance. I'm not talking about being rich. He may bless you with wealth, that's up to Him. I'm not talking about having a huge church, He may give you thousands, that's up to Him. I'm talking about spiritual transformation in the lives of the people whom you lead. How amazing can it get!? But right in the middle, Jesus asks a very penetrating question, "Are your hearts hardened?" (Mk. 8:17) 'Do you have a hardened heart?' You see how all this comes together? Do you see the reference to understanding? Do you see the reference to ears? Do you see the reference to the feeding? And then do you see this penetrating question? Where did Mark get the right to say that these disciples had hardened hearts? He didn't have the right to say that. Who was he to say that? He just planted that seed in Mark 6:52 so he would develop it in Mark 8:17. 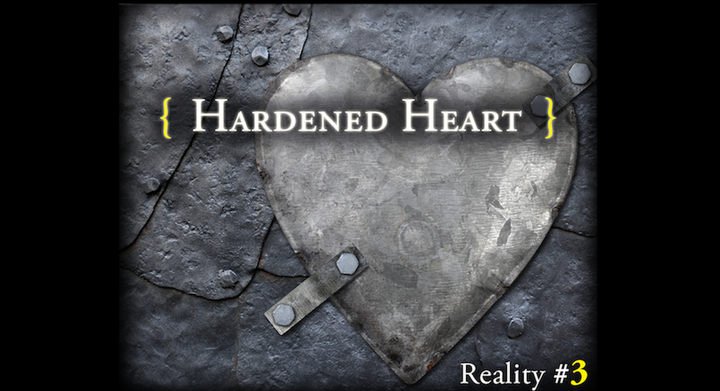 Do you have a hardened heart? You see, the heart of the leaders is the heart of the matter. The problems that you're wrestling with are not due to your head or your hands. They're due to your heart. Now your heart is causing you to think wrongly. Your heart is causing you to measure incorrectly. Your heart is causing you to strive for things you should not be striving for. Because of a hardened heart. Because of our hardened hearts, we will try to turn the five thousand into five. Yes…But Jesus will never lessen the requirement.